"Today we knew, and we've been speaking to our sports psychologist about this, we knew that it was a massive race for Galen. It's been two years, and he's improved a lot, but hasn't quite got that big result that says he is one of the best in the world, one of the top five, six, seven ... you know, a time that shows that." - Alberto Salazar, talking after Galen Rupp's 26:48.00 American record run. The quote comes from a fantastic article with lots of great quotes from Salazar and Rupp. *AP Recap: Bolt: "I think all the tutoring just stopped." *Terrible Start Costs Yohan Blake World Record! His start was .26 - more than .10 off others - or he'd be the world record holder. *Bolt On Blake: "That's amazing. He ran a wild time." We Can't Believe This Made It Into Print: Famed Journalist Phil Hersh Asks: Is Blake Doping? "So, yes, I am going to raise the could-doping-be-involved specter on Blake, and someone is going to say that is racist (Blake is black; Rupp, white) or jingoist (Jamaica vs. USA)." *LRC MB Blake 19.26 !!!!!!!!!!!!!!!!!!!!!!!!!!!!!!!!!! 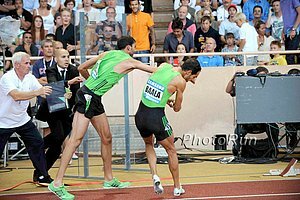 IAAF Preview: Diamond League Season Concludes In Dramatic (Or Disgraceful?) 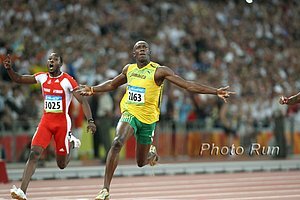 Fashion The 2011 season could be concluding in dramatic fashion with a fan's dream of Yohan Blake versus Usain Bolt at 100m. Instead, they'll race in separate events and we simply call that a disgrace. Thankfully, the meet is full of fantastic action all over the place, including possible world record attempts in the men's 800 and women's steeple. The meet gets underway at 1:25 ET with the re-return of Kenenisa Bekele and an American record attempt at 10,000 by Galen Rupp. Plus Morgan Uceny tries to keep her DL lead and $40,000. All of that plus a reverse 400m. *Relaxed Rudisha Talks About 2012 And Tries To Avoid World Record Talk He says he may try the 1k if he wins Olympic gold in 2012 as a pre-run for a possible 1,500. *Bolt Says Since He False Started At Worlds, He's Not Relaxing In Brussels "I do hope I can conclude this season in a beautiful manner, so that I can start next season with a good feeling." Mo Farah Running 2 Mile (AJ Acosta), Bernard Lagat In Mile Live streaming in US at 8 am eastern here. Just like the fans would be better off with Bolt-Blake on Friday, Lagat-Farah at 2 miles would be an incredible race. The hurdles has Richardson, Oliver and Turner. And we now know why Farah won in Daegu - he stayed in a Holiday Inn Express (or is at least sponsored by them). NCAA 3rd Placer In 2011 Mile, Joe Buckman Reflects On Her 4:05 1,500 PR 7+ seconds have come off since she left the Ducks. Brussels DL Finale Friday: Bolt Still Has Something To Prove In Friday's 100m Despite the fact Usain Bolt and Yohan Blake are not racing each other, this is a great meet. Morgan Uceny goes for the 1,500m Diamond League title, Galen Rupp and Kenenisa Bekele run the 10k, and Sally Pearson goes for a perfect season. Start lists here. Bolt 9.85 Win, Robles 13.00 Over 13.04 Richardson, Maggie Vessey Wins 800, Pearson Stays Perfect Usain Bolt got a mediocre start and then scorched the field the second half to win in 9.85. Maggie Vessey got her first European win of the year, as Nixon Chepseba held off world junior mile record holder Ilham Özbilen (William Tanui), winning in 3:30.94, and Jason Richardson ran fast but lost to Dayron Robles again. Carl Lewis Back On NJ Senate Ballot King Carl could become State Senator Lewis. Oscar Pistorius To Try To Get IAAF To Let Him Run 2nd Or 3rd Leg On 4 X 400 That way he can make a total mockery of the sport. 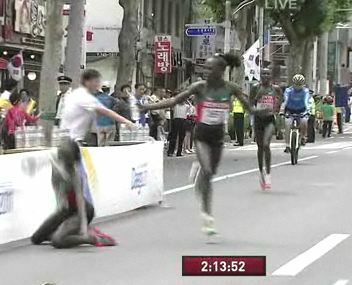 Ethiopians Dominate At Africa Games They went 1-2-3 in the men's steeple, and 1-2 in the women's 5k. IAAF: Finland Men Beat Sweden In Famous Annual Duel It was a close meet for the men, but on the women's side Sweden dominated. *3 More Top Female European Marathoners Join Liliya Shobukhova At Chicago French record holder Christelle Daunay, runner-up at the 2010 London Marathon Inga Abitova, and Maria Konovalova, who was third at Chicago last year. After Finishing 13th At Worlds, LJer Marquise Goodwin Changes His Mind And Decides To Play Football At Texas Originally, he was going to take the fall off and focus on getting ready for London. "Mother Of All Parties" Prepared For David Rudisha's Homecoming "Twenty bulls will be slaughter for an anticipated 10,000 guests who will attend." Oscar Still "Pist" Off At Critics, IAAF He says that he shouldn't have to run lead off leg of the 4 x 4 as he claims he's run many other legs before "without incident." *Is Oscar Pistorius Devaluing The Paralympics? Edit: Says, "This piece has been taken down pending an investigation." Sad: Seraphino Antao, Kenya's Only Short Sprinter To Win A Medal At A World Championships, Dies At 73 He won the 100y/200y at the 1962 Commonwealth Games, making him the first Kenyan athlete to win a gold medal at an international level. Bad: British Agent/Manager Ian Ladbrooke Has Cheated Elite Runners Out Of Close To A Half Million Dollars In Winnings Includes athletes such as Boston Marathon champ Caroline Kilel as well as top marathoners Wilson Chebet and Patrick Makau. After Being Asked If He's An "Inconvenient Embarrassment" For T&F, Oscar Pistorious Cuts Short A BBC Radio Interview We don't know how anyone could call him an embarrassment. We'd call him an inconvenient inspiration. Salazar Praises Farah & Rupp - On Rupp: "He was going for it, and he's not scared. He's young and I'm just going to get him a little stronger." Centro: "When I found myself in medal range, I just kept digging down." Now it's time for Centro Nation to party. Nick Willis Is Confused As To Why He Didn't Have His Patented Kick At Worlds He needs to figure out what happened in the semifinal. When you get pulled out on a stretch, the odds of you recovering two days later are next to nil. Be Thankful You Don't Live In Uganda Moses Kipsiro's Preparations For Daegu Were Hampered By Illness And Threats On His Life The 12:50 performer apparently also has had some Olympic funding stripped for some unknown reason. LRC Bolt Back - 19.40 ... Lemaitre Medals - 19.80 ... Vlasic, Thor, Dix - Silver ... We recap the non-distance action from the penultimate day in Daegu, including Sally Pearson's phenomenal 12.28 in the 100m hurdles, a super-fast 200m final, and more posing from high jump 2nd-placer Blanka Vlasic. 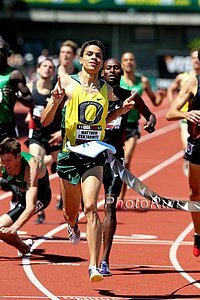 LRC: 1,500 Semis: Matt Centrowitz Puts On A Clinic As He, Asbel Kiprop And Silas Kiplagat Cruise Into Finals The American champ ran like he belonged from the very start and won his heat in a race where he never left the rail and looked like a total veteran, not a 21-year-old rookie. 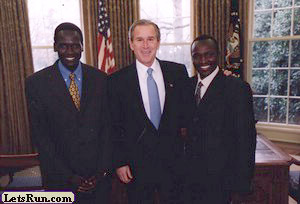 Meanwhile, a few names like Amine Laalou, Deresse Mekonnen, Leo Manzano and Daniel Kipchirir Komen fell by the wayside. Former FSU product Ciaran O'Lionaird advanced easily as Nick Willis surprisingly struggled and sought medical treatment afterwards. *Extereme Dehydration May Have Caused Nick Willis To Have A Hamstring Problem He was carried off on a stretcher (great pic included). LRC How Rudisha's Night Was Almost Ruined David Rudisha is now safely in the record annals as a world champion, but a little-noticed collision almost cost him his shoe and the title. We've got the photo evidence to prove it and virtually unanimous WR predictions from his rivals. Also: Oscar P and RSA are set to vie for a 4 x 4 medal, while Kenya's 4 x 4 sprinters heroically made the final ahead of medal favorites Bahamas ... but will Rudisha be running in the final? We asked Kenya's top sprinter. IAAF: Great City Games Recap - Farah, Dix And Lagat Thrill Walter Dix ran 14.65 in the 100m while Mo Farah got an easy 2-mile victory and Bernard Lagat got an easy mile victory. 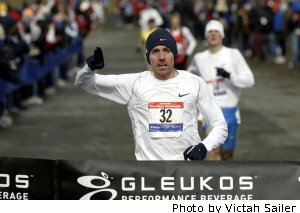 Bobby Curtis Making Half Marathon Debut In Philly Curtis: "I don't think I'm in the best shape I've ever been in. I'm just getting back into it. So I think 62 or 63 minutes would show I'm right on the pace I should be for the New York City Marathon." Adam Goucher: Officially Not Retired And Will Chase His Olympic Dream Sunday At RNR Philly Half Marathon This may be the QOD for Sunday: "Does it sound like a crazy dream to imagine running my first marathon and qualifying for the Olympic Games? Maybe. But once again it is my dream. It belongs to me. I am happy to be running and racing again for the love of the sport and to be a part of the running community. I know people will judge me and have all manner of opinions about my future and my chances but these are not my concerns. I am running free." Cow Harbor: Deena Kastor And Mo Trafeh Running Cow Harbor Kastor is in a fight against time to come back from childbirth to get ready for the Olympic Marathon Trials in January. Jason Lehmkuhle and Andrew Carlson also running. Phil Hersh: "All those stats are just a way to make a simple point: most of the world doesn't give a flying fish about swimming." Usain Bolt is way bigger than Michael Phelps. Mo Farah Is A Shining Example Of Multiculturalism "Being British and proud isn't a birthright, but a way of life open to anyone who is willing to muck in." Meanwhile, the British PM says multiculturalism has "failed." Cameroon Sprinters Go Missing On Way Home From Jr. Commonwealth Games No passports and £10 each. Good luck. Bryan Clay To Participate In USOC's "Britain Bound" Program Clay and other reigning Olympic and Paralympic gold medallists are going on a tour of locations surrounding Great Britain. He'll do a "caber toss" and "stone put" at the Highland Games. Next Week: Jenny Simpson (Lagat, Symmonds, Laalou, Hannah England, Sally Kipyego) Running Fifth Avenue Mile That's World Champion Jenny Simpson. 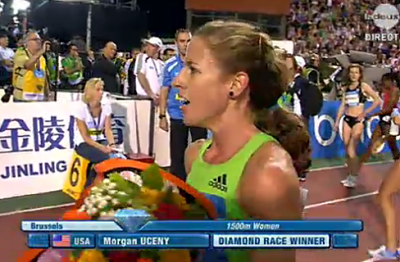 Great fields, although Morgan Uceny (who could win the Diamond League this weekend), may be calling it a season. Berlin: Patrick Makau To Take On Haile G At BMW Berlin Marathon Haile G could actually lose a marathon or enter one not as the favorite. Chicago: Evans Cheruiyot And Bernard Kipyego Join Bank Of America Chicago Marathon Field, Ryan Hall's Got A Chance Last year, with Sammy Wanjiru and Tsegaye Kebede squaring off, Chicago was maybe the greatest marathon finish we've ever seen. This year, it is much more wide open, and if Ryan Hall ever wants to win it, this might be his best chance. 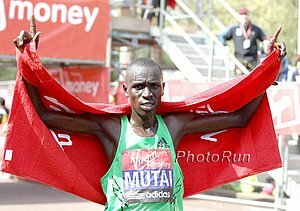 The final additions to the field were announced yesterday and they include 2008 Champ Evans Cheruiyot, former World Half Marathon runner-up Bernard Kipyego, plus two 2:05 Ethiopians who have some question marks coming in, Bazu Worku (just dropped out of Worlds) and Getu Feleke (has run one race all year). Moses Mosop is the one name on paper Hall is worrying about big time. 10 World Champs Gold Medalists With The Most To Prove In 2012 Yohan Blake is an obvious one, as well as 10k winner Ibrahim Jelian, better known as the guy who beat Mo Farah. List also includes 4 US athletes. "What if they held a World Championships and no one knew about it? Well for track and field in the US that's just about what happened." False-Start Question Trips Up Jamaican Beauty Contestant And Costs Her The Win It's funny to think that this issue is common knowledge in Jamaica, while in the US almost no non-track fans could have answered it. 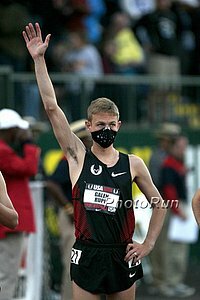 Friday In Brussels: Rupp Vs. Africans - Brussels 10,000 The message boarders are rejoicing with Galen Rupp running the 10,000m in Friday's final Diamond League Meet. Plus, they'll see Morgan Uceny in the 1,500m as she tries to win the Diamond League title. And Usain Bolt and Yohan Blake are both running. And showing why no one cares about our sport, Blake is in the 200 and Bolt in the 100. *Are Usain Bolt And Yohan Blake The New Usain Bolt And Tyson Gay? By that we mean the two guys who have a "rivalry" but never race. This article makes it seem like we might not see an Usain Bolt vs. Yohan Blake match up until the 2012 Olympics (August 5th apparently). *Brussels Entry List Walter Dix in the 200 against Yohan Blake, Oscar P in the 400. Men's 800 and 5k look good with David Rudisha, Abubaker Kaki, Asbel Kiprop and Alfred Kirwa Yego in the 800, and in the 5k Imane Merga vs. Gebremeskel. Remember Gebremeskel got the Worlds bronze when Merga was DQed. Other Upcoming: Mo Farah To Run At Great North City Games This Saturday It's a team competition: GB & Northern Ireland vs. the US. Article doesn't mention what Farah is running, but one would assume the 5k, 10k or both. *Yohan Blake's 9.82 Highlights 90th Berlin ISTAF Meet Before 51,812 Blake ran 9.82 and afterwards said, "I could have run 9.7 easy." Kirani James won, so did Paul Koech and Jesse Williams, as Janeth Jepkosgei beat Caster Semenya in the women's 800. *Olympic Champ Yelena Isinbayeva Pulls Out Of ISTAF Berlin, Citing A "Lack Of Form" Remember she was a disappointing 6th at World Champs. *US Victories For Carmelita Jeter In 200, Jenn Suhr In Pole Vault, & Brittney Reese In The LJ In Zurich DL Jenn Suhr beat WR holder Yelena Isinbayeva, but lost the overall DL by 1 point to German Silke Spiegelburg. 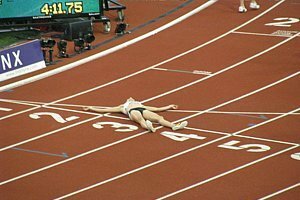 *Sally Pearson Wins 100m Hurdles She'll run a flat 100 in Italy this weekend and then the hurdles again in Brussels DL. On The Boards: Blake 9.82 (0.0) !!!!!! Q&A With NYRR: 9/11 A Decade Later "Within days of the Sept. 11, 2001 terrorist attack on the World Trade Center, then-Mayor Rudy Giuliani sent word to New York Road Runners: the New York City Marathon, scheduled for Nov. 4, must go on." More Distance: Lauren Fleshman Gives An Inside Look Minute-By-Minute Of Her WCs Experience "I didn't know who won, who got medals, who I pipped at the line, what time I ran, or what place I finished. Complete immersion into maximum effort drowned out all my senses ... all I could think about was this: June 24th: 8th in the USA September 2nd: 7th in the world. Just goes to show, you never know what awaits you. Believe in turnarounds. Believe in yourself." LRC: Women's 800m Semifinals: Caster Semenya Is Back, Maggie Vessey And Alysia Montano Make The Final Caster Semenya looked like Semenya of '09 and if that is the case, there is nothing else the other women in the field can do. For the first time since 1988, two Americans are in the final. Can the US get its first medal since the late Kim Gallagher's bronze in '88? LRC: Rojo Blogs From The Couch About Daegu: Post #2 - 6 Quick Thoughts About The Men's 10,000, Men's 100m And Men's 800/Thoughts On Human Nature's Attempt To Explain Everything Rojo laments that humans seemingly always try to have a nice and neat explanation for everything like Bolt's DQ or Farah's narrow loss and normally it ends up being wrong. Along the way, he refuses to throw Bekele under the bus and hopes for his resurrection but seemignly has no problems with running all over Matt Tegenkamp. Heartless. Plus big praise for Maurice Greene, Nick Symmonds and even Khadevis Robinson.